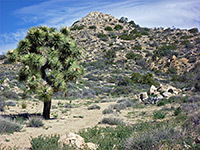 For a large national park, Joshua Tree has relatively few maintained trails, though the six main routes are quite representative of all the different environments. There are also a dozen short nature paths, some paved, that provide a quick introduction to the native rocks and plants. More challenging hiking is possible on many unmaintained trails, the majority through the northern mountains close to the park roads, though various longer paths penetrate the more remote ranges to the south and east. The Joshua Tree Hiking Map shows the location of each trail. Boy Scout 8 1,340 Starting in the north by the ranger station on the road to Indian Cove, the sometimes sandy Boy Scout Trail crosses open desert slopes dotted with cholla cacti and creosote bushes then follows a narrow canyon into the Wonderland of Rocks. 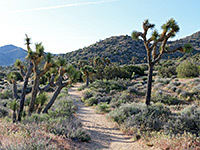 Several miles of the path run right through the scenic boulders and cliffs, before it enters open country once more though now filled with Joshua trees, before ending at the southern trailhead along the main park road. A car shuttle would be useful here. California Riding and Hiking 36 varies One of many unconnected sections of the California Riding and Hiking Trail crosses the western half of Joshua Tree National Park, running from the Black Rock Canyon campground through mountainous terrain to Upper Covington Flat, then down into the Joshua trees and creosote bushes of Lost Horse Valley where the path crosses the road to Keys View. It next skirts Ryan Mountain, the Jumbo Rocks campground and Belle campground, ending with a descent past the edge of the Pinto Mountains alongside the main park drive to the northern entrance station. Various rewarding day-hikes are possible over sections of the path, or a several night backpacking trip along the whole length. 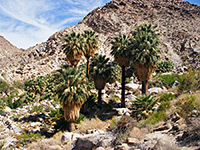 Fortynine Palms Oasis 1.6 300 This relatively easy and quite popular path climbs to the top of a barren ridge overlooking the town of Twentynine Palms then drops down to a sizeable group of California fan palms, growing at the junction of two rocky canyons. Lost Horse Mine 2 480 On the road to Keys View, a side track branches westwards ending after a mile at a small parking area at the edge of 5,178 foot Lost Horse Mountain, from where a trail (also once a vehicle track) ascends to the summit, en route passing several restored buildings from the Lost Horse Mine. 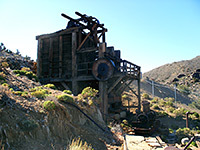 One of these, the old ten-stamp mill, is particularly well preserved. Past the mine, a less used, unmaintained path continues along the mountain ridgetop for a while then descends a ravine and loops back to the start - total length 4 miles. Lost Palms Oasis 4 450 Perhaps the best day hike in Joshua Tree National Park, the route to the fan palm trees and pools at Lost Palms Oasis encounters rocky ridges, sandy washes, many Sonoran desert cacti and granite boulders, with frequent impressive views over the surrounding mountains. The trailhead is close to the southern entrance to the park, at Cottonwood Spring. Mastodon Peak 3 (loop) 300 Forming a loop with the first part of the Lost Palms Oasis Trail past Cottonwood Spring, this path crosses a mixture of rocky slopes and dry sandy washes, reaching a highpoint at Mastodon Peak, near which is the remains of an old gold mine. The summit affords long distance views in all directions, especially south where the Salton Sea is clearly visible, 20 miles away. Ryan Mountain 1.5 1,060 Ryan Mountain is a somewhat isolated yet easily reached peak surrounded by open plains so the views from its summit are some of the best in the park. The well used path to the top begins at a parking area along the main road, a mile west of the turn-off for the Sheep Pass group campground, and climbs steadily up the slopes, passing scattered vegetation of Joshua trees at first then pinyon/juniper pine at higher elevations. Arch Rock 0.5 (loop) level From the White Tank campground (near site 9), this easy path leads to a small natural arch in the whitish granite rocks that are abundant in this section of the park. Barker Dam 1.2 (loop) 40 Built by cattle ranchers at the end of the nineteenth century, Barker Dam is a small construction that in wet times holds back a pool in the granite boulders just inside the south edge of the Wonderland of Rocks. The loop hike past the pool also encounters plenty of Joshua trees, and a petroglyph panel (defaced by a film crew); it starts from a side road near the Hidden Valley campground. Cap Rock 0.4 (loop) level The paved, level Cap Rock nature trail winds past Joshua trees through piles of large, rounded monzonite boulders in the middle of Lost Horse Valley. The trailhead is along the main road by the junction with the side road south to Keys View. Cholla Cactus Garden 0.25 (loop) level On the west side of Pinto Basin, the short Cholla Cactus Garden nature trail provides a close-up look at the densely-spined Opuntia Bigelovii (Teddy Bear Cholla), which in spring bears large, greenish white flowers. Hidden Valley 1 (loop) 40 Hidden Valley is a small open area enclosed on most sides by tall boulder piles; the short path to the center begins at the end of the side road to the Hidden Valley picnic area. High View 1.3 (loop) 400 The High View Trail climbs a short distance into the foothills of the Little San Bernadino Mountains, for good views over the surrounding desert. It starts near the Black Rock Canyon campground, in the far northwest corner of the park. Indian Cove 0.6 (loop) 50 Starting at the west edge of the Indian Cove campground, this well marked path encounters large boulders, dry washes and a variety of Mojave desert plants. Keys View 0.2 (loop) 50 At the end of the paved Keys View Road, a path climbs to the top of a small peak just to the south for a 360 degree panorama over the Little San Bernardino Mountains, and many places to the south. A longer path (half a mile) heads north from the parking area up to an even better viewpoint, on the top of a summit at 5,558 feet. Oasis of Mara 0.5 (loop) level At the main Oasis Visitor Center in Twentynine Palms, a paved path reaches the most accessible of Joshua Tree's six California fan palm oases, though also the least natural, as the surroundings are relatively well developed. Skull Rock 1.5 (loop) level This popular loop trail circles the large boulders either side of the Jumbo Rocks campground, including the distinctively-shaped Skull Rock (which can also be viewed from the main road). 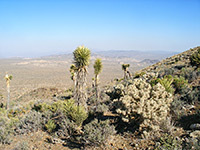 Interpretive signs along the way describe the plants and animals of the Mojave Desert. South Park Peak 0.6 (loop) 230 Just outside the park; a loop along a short ravine and up to a minor though prominent summit overlooking the town of Yucca Valley. Contact Mine 1.8 700 An interesting assortment of old mine relics including sealed shafts, iron equipment and spoil heaps is reached by a relatively easy hike into the mountains near the park headquarters. The route is initially up a dry wash, then along an old vehicle track. Desert Queen Mine 0.8 150 Route to a viewpoint then down the side of a rocky canyon to the site of an old mine, where relics include shafts, adits and rusty equipment. One option for a longer hike is to climb up an adjacent canyon, past another mine location and across higher land to Pine City, returning via the trail to that location. 8.6 including spur trails 1,180 The Panorama Trail affords wide ranging views of the Little San Bernadino Mountains, passing Joshua trees at the start (near the Black Rock Canyon campground), then pinyon/juniper pine at higher elevations. Several side trails branch off, including a short spur to 5,103 foot Warren Peak. Queen Mountain 2 1,100 From the end of a side road across Queen Valley, a little-used trail climbs the steep southern slope of Queen Mountain, ending at an elevated viewpoint near the summit - one of the highest peaks in the park. Rattlesnake Canyon 1.2 400 A faint path enters the lower end of Rattlesnake Canyon, near the Indian Cove campground, and follows the narrow drainage into the north section of the Wonderland of Rocks, offering a quick introduction to this scenic area. Silver Bell and El Dorado Mines 4 250 Two mines in the Hexie Mountains in the center of the park, which may be visited by a moderate loop trail, partly cross-country; relics include two well-preserved wooden tipples. Split Rock 2 (loop) 100 This easy path encounters similar scenery to the busier Skull Rock Trail, and starts close by, at the end of a short spur road on the north side of Park Boulevard. Victory Palms 5 850 Victory Palms and nearby Munsen Canyon are two rarely-visited fan palm oases east of the maintained trail to Lost Palms Oasis, reached by heading downcanyon after the end of the main path; the ravine becomes quite rough and narrow, and travel requires scrambling over boulders in places during a quite steep descent. The Victory Palms grow near sandy ground as the drainage becomes wider and more level. A side trip northwards leads to the even more remote oasis in Munsen Canyon. overall The main path into the heart of the Wonderland of Rocks begins 1.5 miles along the south section of the maintained Boy Scout Trail, crosses open Joshua tree flats then enters the rocks, tracking along narrow, sandy washes as the surrounding boulders become ever larger and more impressive. Easy travel ends at Willow Hole, a transient water source in a hollow beneath a willow tree. Wonderland Wash 1 level Starting at the same trailhead for Barker Dam, a well trodden path heads a little further north then follows a wide, sandy wash into the south edge of the Wonderland of Rocks (see panorama). There are limitless opportunities for off trail exploration, both for regular hiking and rock climbing.